Answer: No problem LP. I always try to keep my answers simple. Just remember that when you write your report, you should never just copy and paste from Sky Lights. You’ll need to express things in your own words. And following the links in this post will provide you with additional material. The image above is the first actual photo of an exoplanet, taken by the ESO with their Very Large Telescope on Cerro Paranal in the Atacama Desert of northern Chile in 2005. This is an infrared image. It shows heat radiation, and not what your eyes would see. The exoplanet is the orange (cooler) object, and the star it orbits is the larger brighter (hotter) object. The exoplanet’s “name” is that long string of numbers and letters at the top left. The image is so blurry because these are both very small objects very far away — about 230 light years (2.2 x 1015 km, or 1.4 x 1015 miles). The entire image is only about 1 arc-second wide (1/2000 the apparent size of the Moon). Also, infrared images always tend to be a bit blurry, since you’re seeing the heat on and around the objects. 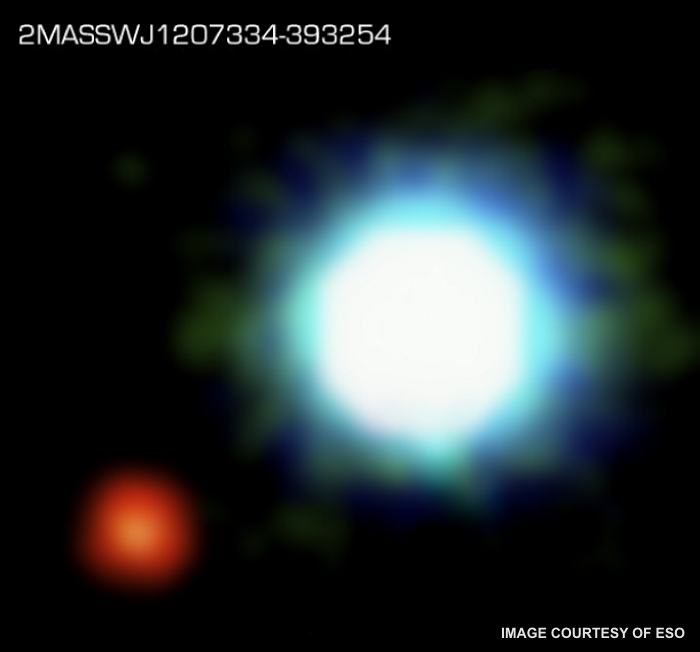 Astronomers believe this exoplanet is a gas giant about 5 times the size of Jupiter. The star it orbits is a brown dwarf, much cooler, dimmer, and smaller than our Sun. The exoplanet’s orbit around that star has a radius of around 55 AU (astronomical units), where Earth’s distance from our Sun is defined as 1 AU. You can see 10 more images of exoplanets in this excellent gallery. Even though more than 850 exoplanets have been discovered to date, most of them are so close to their star, and their stars are so much brighter, that they’re (currently) not possible to photograph. The popular analogy is that it’s like trying to photograph a firefly next to a searchlight in Boston using a camera in Los Angeles. Try that for your next science project. The vast majority of exoplanets have been detected indirectly. That means we haven’t actually seen them, but we have observed their gravitational effect on the motion of their star. In other cases, we’ve seen a star dim slightly as an exoplanet passes in front of it and blocks some of the light, like a mini-eclipse. So to answer your question, an exoplanet is a planet that orbits a star other than the Sun. The word “exoplanet” is short for “extrasolar planet,” with the “extrasolar” denoting “beyond our Solar System.” And the word “planet” means anything that orbits a star (excluding other stars, comets, or asteroids). The International Astronomical Union has an official definition of “planet,” but it’s somewhat controversial since it excludes Pluto, which many still think of as a planet. Why are exoplanets such a big deal? Only 50 years ago, although they were suspected to exist, no astronomer had ever seen one. But advances in telescopes and imaging technology are now showing that exoplanets are common. There could be 10 billion Earth-like planets in our Milky Way Galaxy alone, some of which may harbor life. It’s a whole new perspective on the ultimate question: Is Mankind alone in the Universe? I hope this answers your question, LP. Now do a great job on that report, impress your teacher, and earn an A+.